http://www.sheetmusic1.com/winston/Thanksgiving.pdf In bar 7 how would I count and when would I play those first two notes in the treble clef, the E and B? Also why is there a treble clef placed in the bass? Does that essentially turn the bass clef into a treble clef ? In bar 13 how would I count and when would I play those first couple of notes that transition from eighth note quavers to 16th note quavers. Sorry for my poor wording I'm not good at reading sheet. Firstly try playing the phrase leaving out the tie marked with an asterisk. 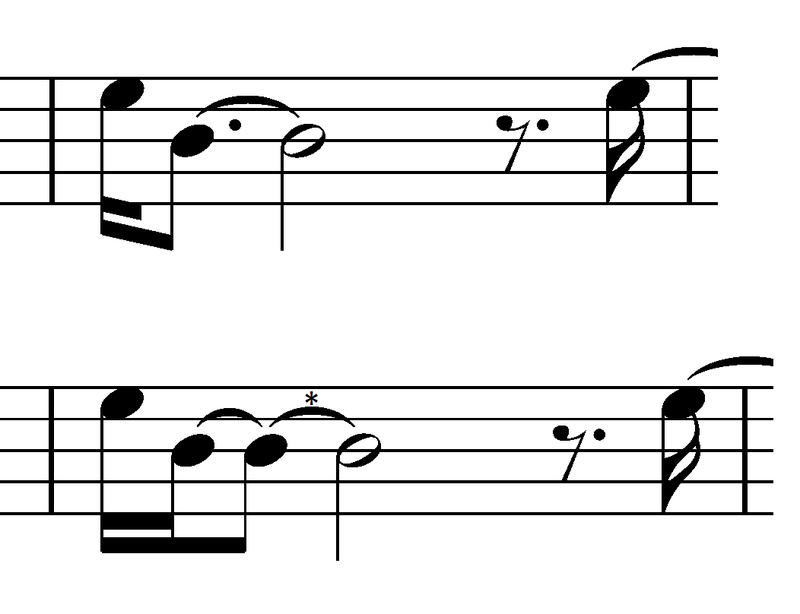 Remember the half note starts on the second beat of the bar. When you're confident you can play it without the tie, try reintroducing it, but make sure you keep feeling rhythmically where the half note starts, even though you're not articulating it any more. You also asked about the bass clef - usually the bottom stave starts with a bass clef, but it can change. This makes it much easier to read left hand parts that go higher than middle C - helps eliminate ledger lines that would be required if the part were notated in bass clef. Finally you asked about bar 13. Try counting this out really slowly, and mark in pencil where the beats fall. The snippet shows how you might do it. If the beats are quarter notes, just count 1 2 3 4 If they're subdivided into eight notes count 1 & 2 & 3 & 4 & - and if there are sixteenth notes you can count 1 e & a 2 e & a etc. The simplest and easiest way is to transcribe such a rhythm by doubling the values of each note length: 16th notes to 8th, 8th notes to 4th, 4th notes to half notes, etc. the same with the rests of course too. (Only the right hand). When the shortest notes are eight, count them as da on beat and as ba off beat. If you still can't read it, double them again. You may say this is a lot of work, but if you have transcribed such patters 3-4 times you will be able to recognize and read them by sight. Till next thanksgiving you will make it!